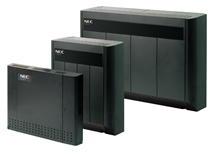 NEC is pleased to announce the availability of the DSX-80 and DSX-160, the newest members of NEC’s highly successful line of key telephone products. The DSX offers you high performance, flexibility and the ability to custom design the system to meet your specific requirements. Innovation starts with the new telephones that feature a sleek, compact design, speakerphones, large displays and a built-in desk stand/wall mount kit with two-position angle adjustment. Enhanced version telephones also offer illuminated dial pads and backlit displays. 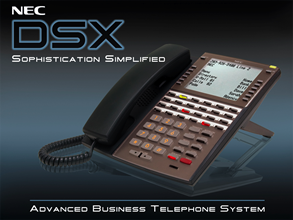 All DSX key telephones and consoles are available in a black or white version. With growth up to 160 ports, the DSX product family is perfectly suited for small to medium sized businesses that require large business capabilities such as T1, PRI and IntraMail support, plus the DSX offers capabilities such as built-in Caller ID (CID) and a 2 port Auto Attendant built-in that are ideal for small offices as well.